There are so many perks to online shopping! You avoid congested traffic, dreadful checkout lines, expensive gas fare, and the list goes on! Afterall, who doesn't love shopping from their favorite stores in their PJs? As great as online shopping can be, it also has its challenges. One of the challenges is selecting your correct size the first time. Will this item be true to size? Should I size up or down? Can I return this if it doesn't fit? We get it! 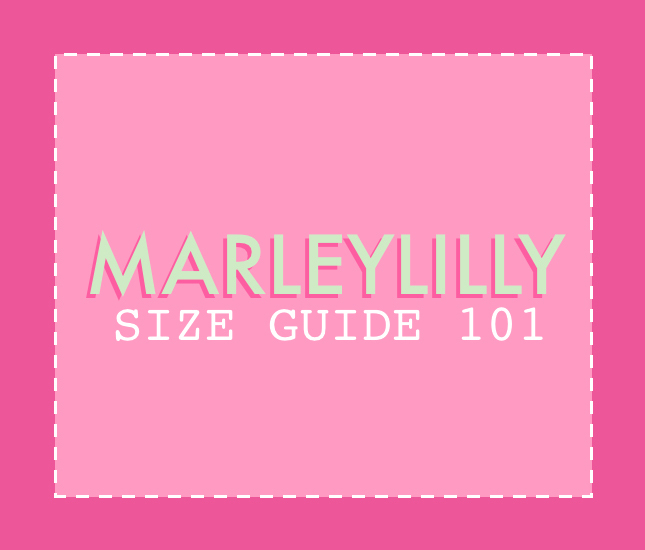 Starting with our new Fall 2018 collection, we’re rolling out the pink carpet with a new sizing guide that will make you more confident selecting a size from Marleylilly! Say hello to our new sizing guide! Each chart will look a little different from product to product. 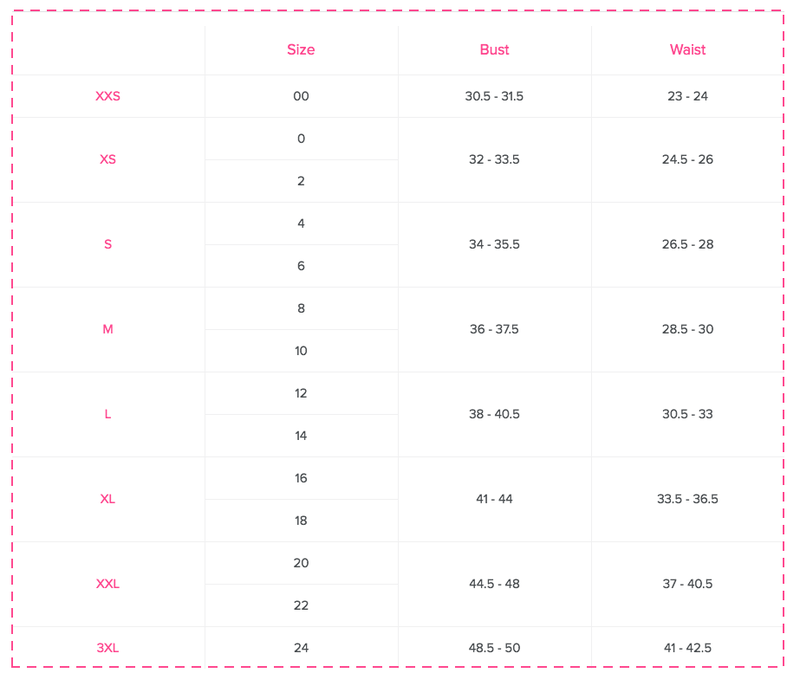 You can find the sizing chart by clicking "learn more about sizing" when you view any of our new clothing pieces. You might notice these are body measurements instead of the flat garment measurements you're used to seeing for Marleylilly clothing. Starting with Fall 2018, all of our garments have been designed with these common body measurements in mind, allowing you to order your size more confidently and consistently. To find your perfect fit, you'll first grab your body measurements! Second, locate your body measurements on the size chart to determine which size works best for you. To get the most accurate body measurements, measure yourself with undergarments only and do not measure over clothing. If you don’t have a measuring tape available, feel free to use a piece of string and hold it against a ruler. Tip, remember to always keep your measuring tape parallel to the floor. Bust: With your arms relaxed at your sides, measure around the fullest part of your chest. Inseam: Throw on a pair of pants that fit well. Measure from the top of your inner thigh down to the bottom of the leg. Another update we're excited to roll out is our new bridged sizing. This is the term we use to refer to garments with combined sizes — XXS/XS, S/M, L/XL, and 2XL/3XL. Starting with our Fall 2018 Collection, "bridged" items have been designed towards the larger end of the combined sizing. For example, a L/XL is going to be closer to an XL compared to a L. So, if you want a smaller fit, we recommend sizing down to a S/M. In the same way, you can also size up! If you’re normally a S/M and want a more oversized fit, you can achieve that with a L/XL fit. 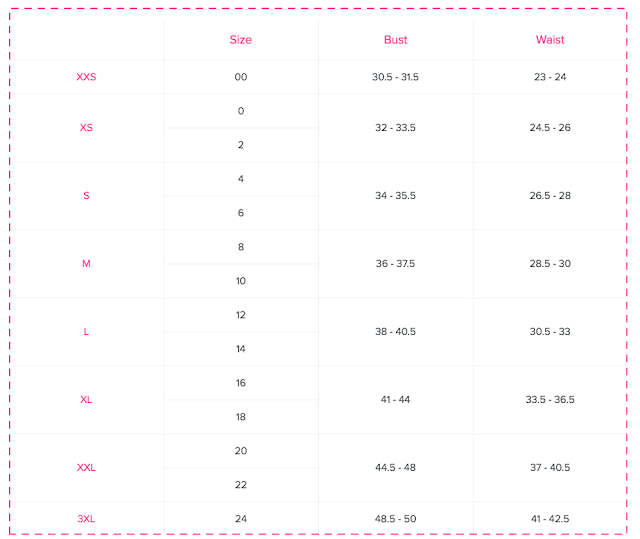 We would love to hear your comments or questions for our new sizing guide. Which pieces are your most excited to see this fall?